Buxenger has released its new version called buxenger 4 simplicity. As its name it is simpler, lighter, faster compared to its previous version. Buxenger also has added more features and PTC sites to its newer version. Buxenger 4 is available for both Google chrome and Mozilla Firefox. 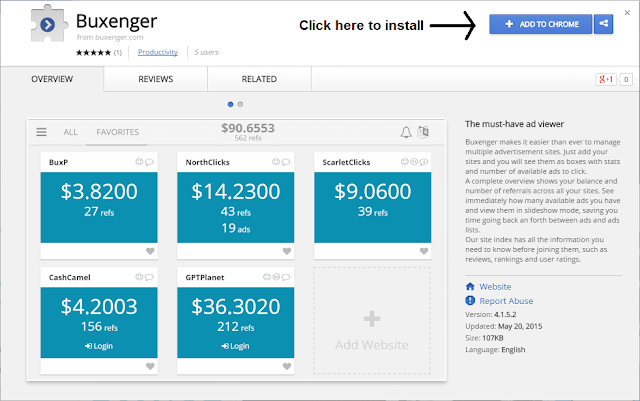 Buxenger will save your 70% precious time time by making ads of all the PTC ready for clicking. With buxenger you can also make lots of PTC refs. Buxenger review, here I’ve explained how to download and use buxenger. Now buxenger 4 is supported on both mac and linux along with windows. You don’t have to log into a PTC site each time. Every time you you launch the app all the PTC sites will be logged in automatically. You can start your work directly after app launch. With buxenger you can maintain accounts of hundreds of PTC sites in one place including your earnings and refs. In buxenger 4 you can watch ads of PTC sites simultaneously which can save 70% of your work time. For example if it takes 1 hour to click the ads in direct PTC page, it can be completed within 15 minutes using multi tab view button. Buxenger is the great downline builder. You can get refs for hundreds of PTC sites using single mobile app. After registration click download. Now you will be redirected to the chrome apps page as shown below. Click “add to chrome” to install. Follow the same procedure to install in mozilla firefox. After successful installation the logo/favicon will appear next to the address bar as shown in the picture above. Click the icon to start the app. Enter your username and password to login. After login click add website button to join or log into a PTC site. Lots of PTC sites will appear as shown below. 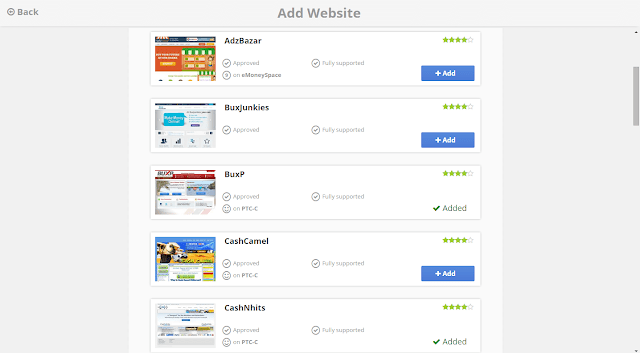 PTC sites are listed under categories featured, buxenger supported and recommended PTC sites. You can join a PTC site directly from buxenger itself. You don’t have to search for genuine sites. 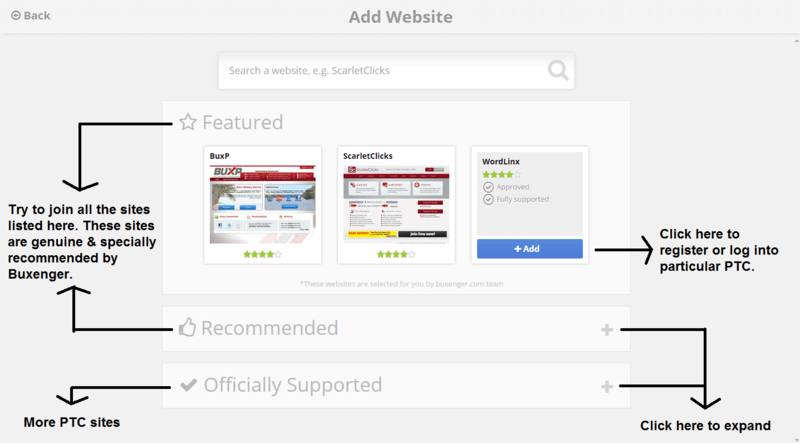 Good sites are displayed under featured and recommended tabs. 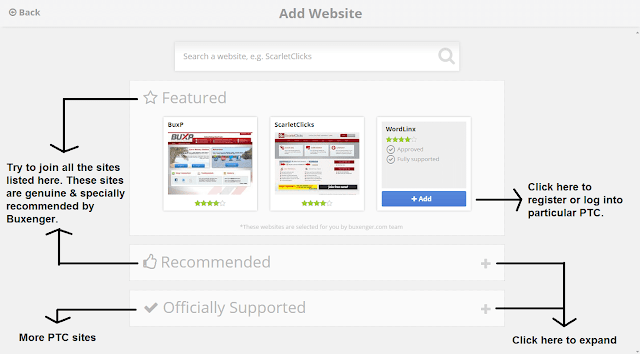 Try to join all the sites under recommended and featured tabs. The sites listed there are selected by buxenger for their members. Move the cursor on the site which you’d like to add or join and click add button. 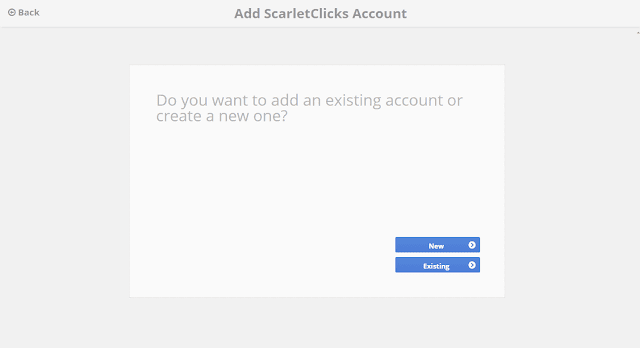 I’ve clicked on scarlet clicks for example. If you’re already the member of that PTC site, click existing to login. If you’re a new member click new to register. Registration process take not more than 1 minute. After successful registration that particular PTC site will be added to your list. After adding PTC sites. Log into each PTC site for first time. Automatically PTC sites will be logged in every time when you launch the app. After logging in PTC sites all information (Balance, no of referrals, no of ads available) about the PTC sites will be displayed as shown above. The total balance will be displayed on the top. So, you don’t have to calculate manually. There are over 400 buxenger supported sites to work. 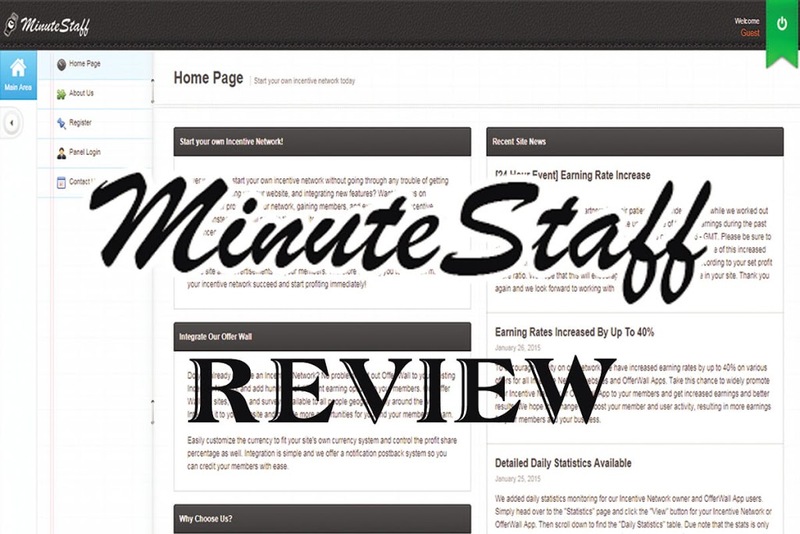 Each site is rated and reviewed. If you wish to join more PTC sites other than recommended read the reviews before you join. 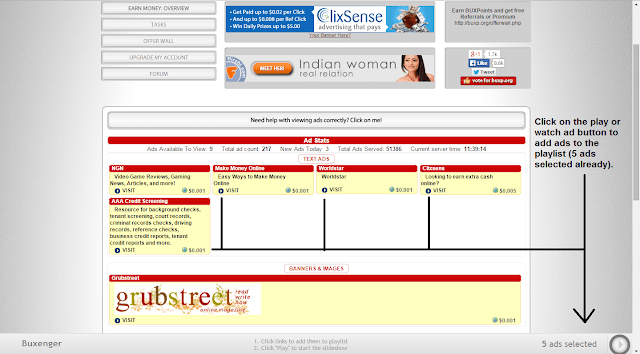 To view ad / work in a single PTC site, click view ads button that is indicated in the above picture. I’ve clicked view ads in BUXP for example. Click on the ads available to add them to playlist. The number of ads you’ve selected will be indicated below the page as shown in the above picture. Once you complete selecting, click the play button that appears on the right bottom of the page. The ad will be displayed on a new tab as shown above, solve the captcha (will vary for each PTC site), click verify and wait till the stay time completes. Once you get the credited message click the forward arrow indicated in the image to view the next ad. Follow the same procedure to view all the ads. When you return to the my website page the PTC account earnings will be automatically updated as shown above (BUXP). In buxenger you don’t have to close the ad page and click the next ad individually. This will save time and work load. This process will save 70% of time. Hold ctrl and right click on the PTC site on which you’d like to view ads. After selecting the PTC sites there will be two view ads buttons on the bottom of the page. Click “view ads” button to view ads of each PTC site one by one. Click “view ads (multiple tab)” to open ad page of each PTC site in separate tabs. 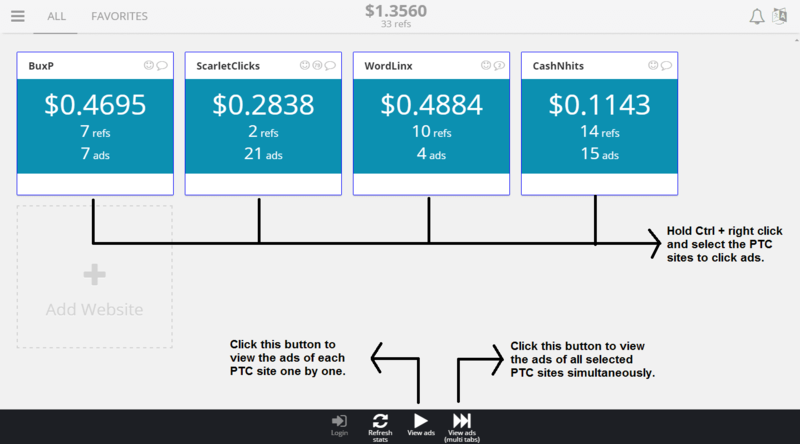 Click ads simultaneously on each PTC site. Just spend one PTC site working time to work in 5 PTC sites. Follow the same procedure mentioned in working in single PTC site to view ads. Few “Forced ad view” ads might not allow you to switch tabs. Stay on the advertisement page to get credited foe watching those ads. If you wish to work only in few selected PTC sites daily add those PTC sites to favorite tab using favorite heart button. This will help you to separate main PTCs from other PTC sites. Favorite PTC tab also allows multi tab ad view. As said before buxenger affiliate program will help you to get hundreds of PTC referrals. If you refer someone to buxenger, every time the buxenger ref join a PTC site he will be your ref also for that PTC site. This applies to all the PTC site. Other than that if you ref upgrade you will get up to $20 upgrade commission. If you feel you can’t refer anyone to buxenger you can buy referral. Buxnger sell a referral for just $1. That particular ref can earn you hundreds of dollars for lifetime through PTC sites. If you wish to create main income from PTC, buxenger will play an important role. Experts review says that buxenger is a great tools for OTC success. The way buxenger looks and easy navigation will increase interest in working in PTC sites. Buxenger acts as very good remainder. You might miss any PTC if you work in browser directly. Buxenger is approved by the PTC sites listed there. Buxenger is professional and passwords are well protected. Buxenger will save your username and password in server and every time when you launch app you don’t have to login each time instead buxenger does for you. Maintain hundreds of PTC sites at one place. Buxenger will give you total number of PTC refs on all PTC site. Also you can get the total balance available from all PTC sites. You might not know about – Bitcoin PTC. Now hiring for part time jobs on – Snagajob. Click here or click the image below to join buxenger. 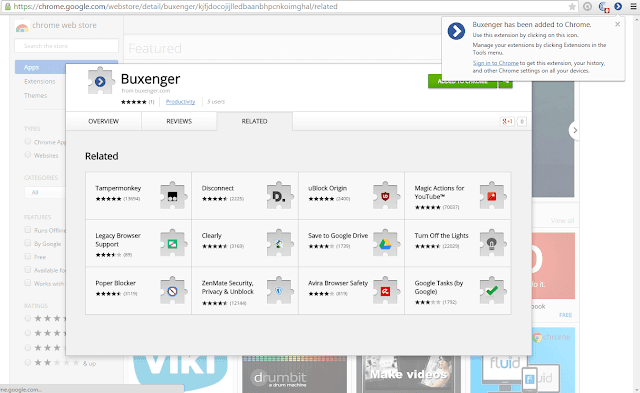 Tags : Buxenger 4 free download, Buxenger reviews, how to use buxenger, features & working procedure.